If there’s a person alive who doesn’t love pound cake, then I’ve never met him. Or her. 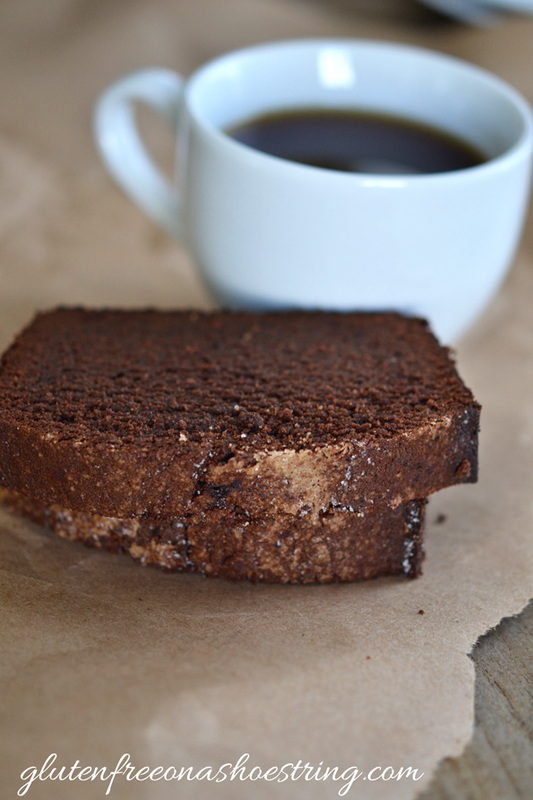 And this gluten free chocolate cinnamon pound cake, a copycat of the beloved Starbucks slice, is just the thing to enjoy with a hot cup of coffee. But let’s make it good coffee, okay? 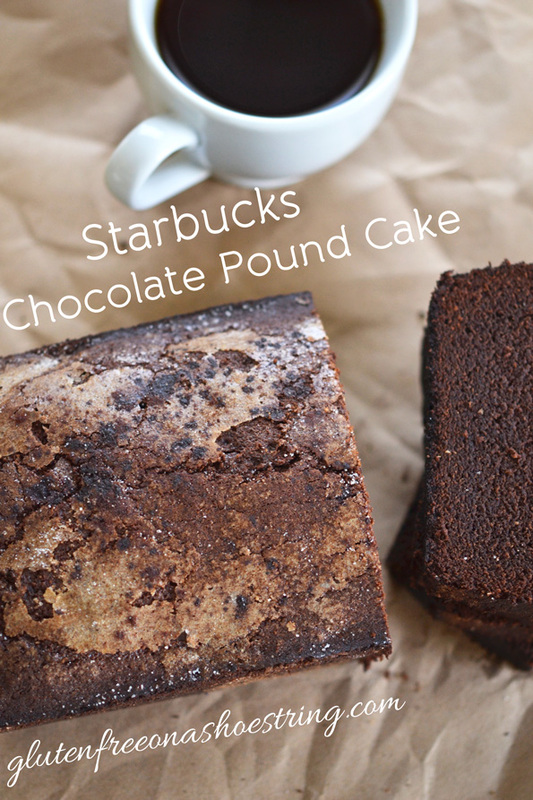 This smooth chocolate butter pound cake deserves it. With its comfy chairs and its thick special mugs for sale, Starbucks is like the coffee mother ship. It doesn’t matter one whit that, if I were one to cast aspersions, I might have a few choice words to say about their burnt coffee. I still end up there from time to time, even if I meant to be somewhere else. It’s really better for everyone involved (especially my children, who know this all too well) if I have coffee every.single.day. And even though I was never even drawn to those treats in the treat case at Starbucks before gluten free was a way of life for my son and me, I now find myself staring into that glass enclosed case, longingly. That – and a very special reader (you know who you are) told me a very compelling sob story about this particular pound cake treat (complete with photos from a recon mission). This pound cake doesn’t start out in a cold oven, like the Gluten Free Iced Lemon Pound Cake (also a Starbucks copycat recipe) we made not so very long ago. It simply bakes low and slow (325°F, for about an hour). It cracks a bit on top, but the crackled cinnamon-sugar-cocoa top is what we seek. 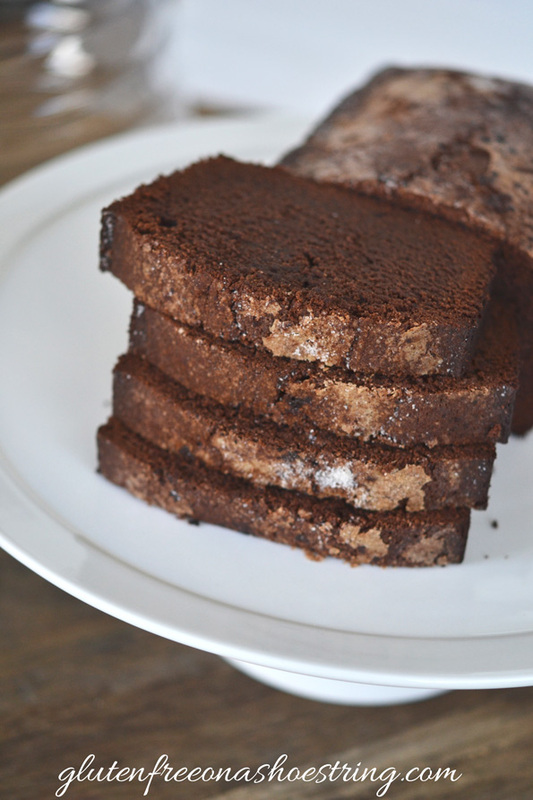 This pound cake is smooth and rich in chocolate, with just the right cinnamon to highlight and enhance the chocolate taste. It’s an all-butter gluten free pound cake, not a cream cheese and butter pound cake, so the chocolate and cinnamon really shine. Gluten Free Starbucks-Style Iced Lemon Pound Cake. Gluten Free Starbucks-Style Vanilla Almond Biscotti. And if you’re still looking for more, turn to page 186 of Gluten-Free on a Shoestring the cookbook for my classic Gluten Free Pound Cake recipe. Preheat your oven to 325°F. Grease an 8 1/2 inch x 4 1/2 inch loaf pan, sprinkle evenly but lightly with cocoa powder, sugar and ground cinnamon and set the pan aside. In a small saucepan, place the chopped chocolate and milk over medium heat, stirring occasionally, until the chocolate is melted and the mixture is smooth. Set the mixture aside to cool briefly. In a medium-sized bowl, place the flour, xanthan gum, salt, cocoa powder and cinnamon, whisk to combine well and set the bowl aside. In the bowl of a stand mixer fitted with the paddle attachment (or a large bowl with a hand mixer), beat the butter and sugar until the mixture falls from the beater in a ribbon when the paddle is lifted (about 3 minutes). Add the eggs, one at a time, and the vanilla, and beat again until well-combined. 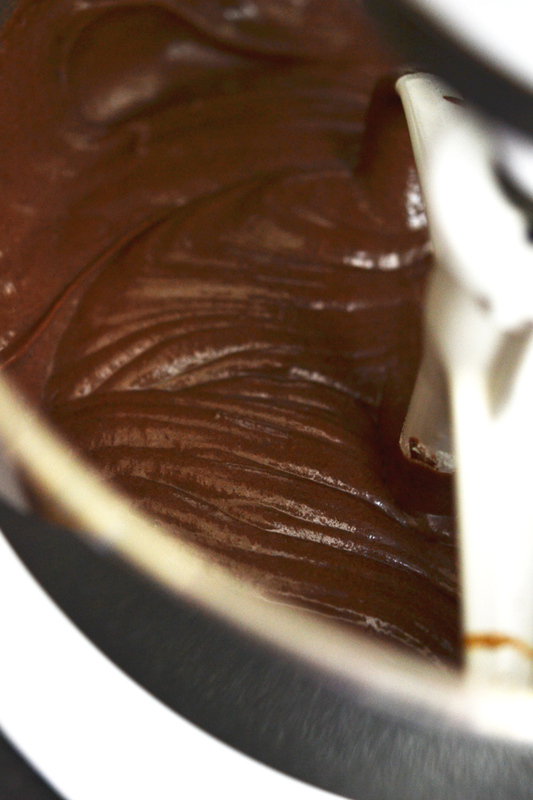 Next, add the chocolate and milk mixture, and beat again until combined. Finally, with the mixer on low, add the flour and cocoa powder mixture slowly. Beat briefly until well combined. The mixture should be smooth and thickly pourable. Pour the mixture into the prepared pan, and smooth the top with a wet spatula. Sprinkle the top lightly with sugar, cinnamon and cocoa powder. Place in the center of the preheated oven and bake until a toothpick inserted in the center comes out with no more than a few moist crumbs attached (about 1 hour). P.S. If you haven’t yet, get your copy of Gluten-Free on a Shoestring Quick & Easy! Your support makes the blog possible! Thanks so much for adapting this! 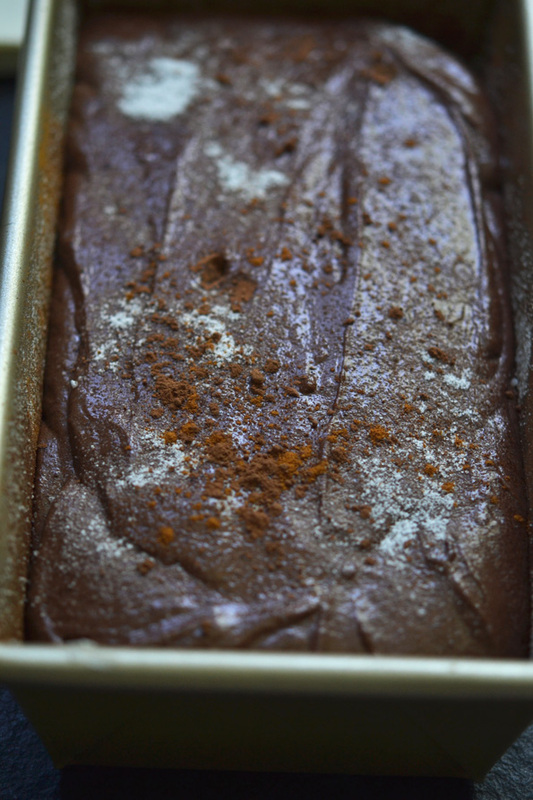 I made it yesterday, and it came out so well- great chocolate-cinnamon flavor and moist texture. My dad wolfed down his piece very quickly, and my husband said it tastes better that the store-bought version I made him try for informational purposes. I am going to take a piece with me when I do my weekly after-running Starbucks hangout, so I can have something even better than the stuff in the glass case! Made this today. Amazing. I am trying to stop myself from a 4th piece. It is in the oven right now-will be hard to top the lemon pound cake, though! My gluten-eating husband has requested the lemon twice already in the past few weeks (I have made it twice and it was perfect both times). We will see how he likes this one, I know I will love it with chocolate and cinnamon. Great blog …great recipes…Going to order both of your books!!! Can you please let me know , which of GF flour mix did you use here? For this recipe, I used my Mock Better Batter blend, but my Better Than Cup4Cup blend would work well, too (click here for all my gluten free all purpose flour blends). Since it’s only 1 cup of flour in the whole recipe, the decision isn’t an extremely critical one. Made the lemon pound cake and it was delish so I know this will be another great pound cake…must make it for Friday’s Dinner in the Garden to share with my quilting buddies at our favorite quilt shop! Hi, Peggy! Those quilting buddies of yours are probably the luckiest group of quilters ever—you take such good care of them! Both of your cookbooks came last week! But…my daughter is also going sugar free so it’s going to be a challenge. Thanks for all your hard work. We are just beginning on this gluten free life. None of us have been diagnosed, we just feel like it’s the right thing to do. This of course looks fab – but since I just made some GF scotcheroos this will have to wait until about ….tomorrow! Also, (drum roll please) I made the tortilla recipe from your books – TWICE and they were EPIC WINS! yum yum yum. how could I have been so afraid? I’m even getting a better rolled out circle each time – but I keep getting creases/seams after I throw it in the cast iron pan — any ideas on how to transfer it so it keeps it’s original shape and does not fold over on itself? right now, I’m peeling it off the plastic into my palm/arm and then throwing it in. It never goes all in perfectly. Anyone? I responded to you on Facebook. It’s very hard to tell, since I’m not there with you, but my guess is that your dough is too wet. When the dough is too wet and/or you’re rolling it too thin (but more likely that it’s too wet), which will make it much more fragile than it should be. Agreed! Is there anything better than chocolate and coffee (well maybe chocolate and wine :0) Would it be possible to share in your recipes the particular revised flour blend you are using? Should I use the Mock Better Batter or the Better than Cup 4 Cup? Should we make it one of the cake flour blends? Thanks so much! For this recipe, I used the Mock Better Batter, but the Better Than Cup4Cup would work well, too. It’s only 1 cup of flour, so the decision isn’t a critical one. :) And no, I wouldn’t go with a cake flour. This looks so yummy, can’t wait to try it. Question, if I wanted to use raw honey instead of sugar, would I only use 2 eggs? I’m afraid it isn’t that simple a conversion, Dede, as honey will not substitute for the structure and protein of eggs, only some of the moisture. I haven’t tested this recipe with any substitutions, though, so feel free to experiment!